Every once in awhile, I connect with a couple who immediately feels like we’ve already known each other for eons. That happened last year with Carolyn and John. We met in December 2010, when John called me early Christmas Eve morning to see if I could do their elopement ceremony after Christmas. (He was waiting for Carolyn to try on wedding dresses when he called!) They were in the desert visiting from chilly Iowa. Fortunately, I was in town and available. I think the Universe had grand plans for us, so everything worked absolutely perfect. We met on Sunday afternoon, they answered a few couple reflections for me, and ‘voila’! After a very early morning ceremony writing session, I sent their customized script to them for review by 9AM. They cried big happy tears upon receiving it and said “This is so truly US. We are thrilled!” We had a blast during their ceremony, with two dear friends as witnesses being present to celebrate. It was a bit surreal how smoothly everything unfolded. As is often the case for couples, they elope with a satisfying sense of simplicity. And then there are circles of family and friends ‘back home’ who really want an excuse to celebrate their union, too! Carolyn and John saw their great opportunity in celebrating with their extended circle of loved ones back in Iowa. And they chose to repeat their ceremony, with me leading it. Needless to say, I was completely moved. And eager to fulfill their wish! We added a few very meaningful flourishes the second time. First, Carolyn’s two sons participated as the bearer’s of the wedding rings. Second, I asked all the guests for their blessings and support upon John and Carolyn’s union. 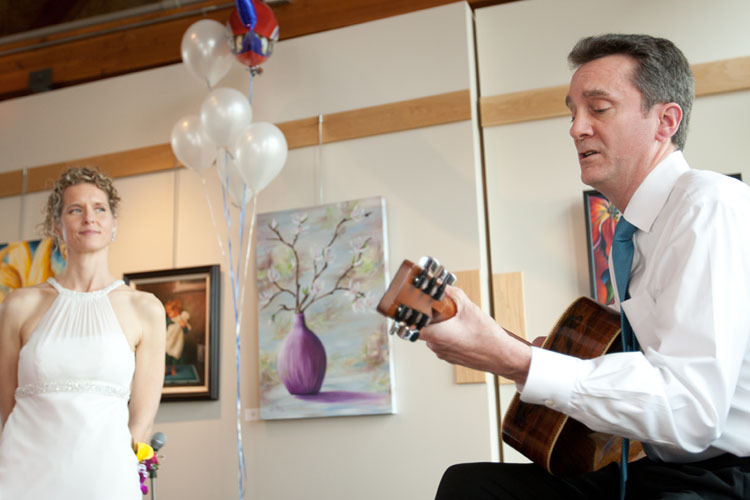 (Of course they enthusiastically responded with “WE DO!”) And third, John wrote and performed a song just for his Bride. I’m not sure there were any dry eyes in the house! And I said this on behalf of everyone before the pronouncement – more happy tears! 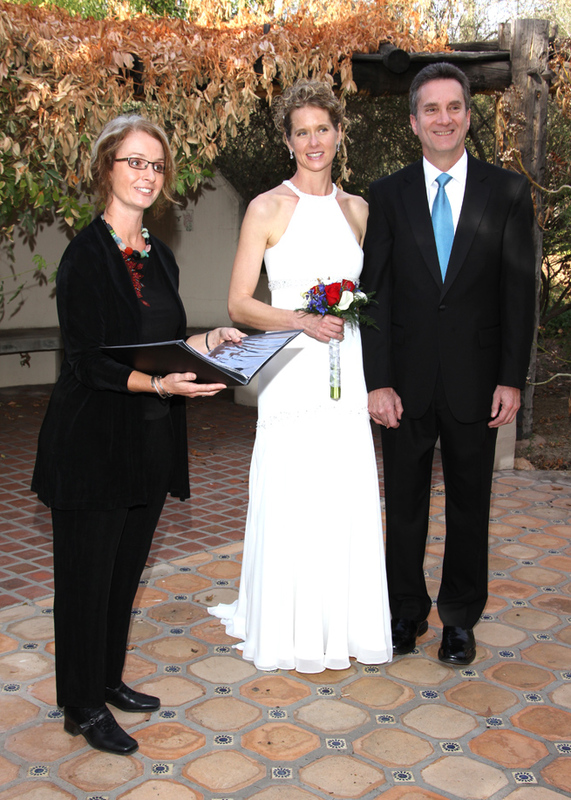 Thank you, dearest Carolyn and John, for this opportunity to serve you and your family as your Wedding Celebrant. I cherish our connection. And I can’t wait to see you again this winter in the desert! 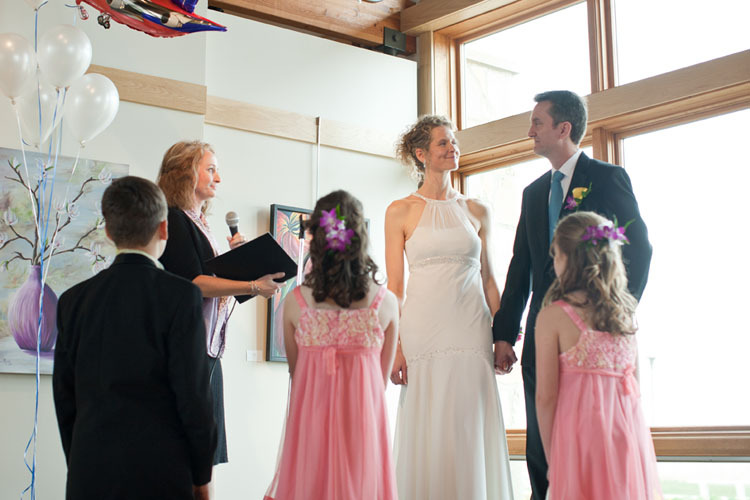 Are you hoping to experience a fun and meaningful ceremony? One where your stories, beliefs and values really shine through? A ceremony your guests rave about at the reception and years beyond? It is possible . . . and I'd love to work with you to make it a reality. Contact me at kristine@sweetgrassceremonies.com or call 520.609.8396 to learn more!